Barely Keeping Up: Why am I awake again?? I am currently listening to a Poison remake of the song "What I like about you" on VH-1. Don't ask me why. I'm awake and that's about all I know. Oh, and this morning I've had a slew of good tunes stuck in my head, too. I'm taking it as a good sign for the day. 1) It's Friday. 2) Tunes in my head include the likes of Tom Waits and Amy Winehouse. 3) I slept pretty good last night despite having to get up 3 times to pee. The sleeping thing is definitely a good thing. Although, I'm a bit upset about the fact that I'm awake at such an early time. borderline realistic. It gave me a good idea, though. In the dream, I was having issues with the tape deck in my car, which I actually am having. Apparently, the Toyota Matrix has a notoriously difficult and uncompatible with tape adapters. So, in my dream I was looking at FM transmitters and I couldn't find an unused radio station. I ended up unplugging the antenna and got the thing to work. Ah, if only it were that easy. 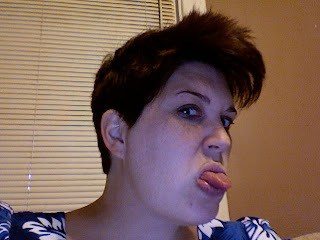 times), I trudged downstairs, went to the bathroom, and found out that I was rocking a wicked faux hawk. Yep, me, punk rock. It looks more pompador than mohawk in the pic, but damn was it amusing to wake up and see. My hair is still in a bit of shock from cutting it the other day and I think it's still waaaaaaay to short, but come next week when it heats up again, I'm willing to bed I won't be complaining. I'm also in need of color (when I can see about an inch of grey at the roots, it's time for color) and I'm trying to decide what color to go. I don't know if I want to stick with the espresso brown color or if I want to do something a little different. Maybe I'll throw in some highlights? Dunno. I have to say that I'm quite pleased with my eyebrows, though. Debi always does such an awesome job with my eyebrows. It's hard to find someone who won't butcher your eyebrows.